Expanded into Oakville in 2015, The Gift of Giving Back is the principal food drive for hockey organizations in the Town of Oakville. 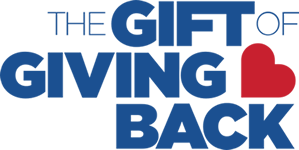 Founded in Burlington, Ontario in 2005, The Gift of Giving Back is now the largest food drive of its kind in Canada that supports, educates and empowers thousands of youth to compassionately give back to their community. Summer and late Fall annual initiatives are launched in partnership with youth athletic organizations to help kids feed kids in their community. Teams will be out in neighbourhoods across Brampton dropping off our iconic blue bags. If you receive one, please give generously as the food goes right to people in our community in need. Athletes are also tagging at various grocery store locations and can be identified with our Gift of Giving Back signs. Dates and location to be announced in late-Summer 2019!